Nestled within Hilton Head’s natural setting of majestic Carolina pine trees, flowering magnolias, and moss draped oaks, Shipyard Golf Club’s 27 holes offer some of the most spectacular golf views imaginable. The course designers, George W Cobb and Willard Byrd, inter-connected two of the three nine hole courses for a unique and challenging 18-hole round. 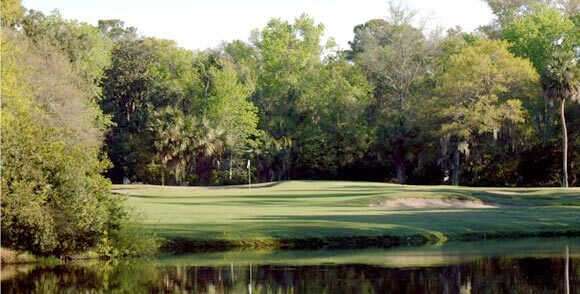 Shipyard Golf Club showcases the tranquil and serene surroundings that make Hilton Head Island so desirable. Its 27-hole, picturesque courses, wind around the local vistas of water and lagoons, teeming with wildlife and thick stands of live oak, draped with Spanish moss. The original Clipper and Galleon courses create an exciting combination of long fairways and perilous hazards, while the Brigantine course winds it way around lagoons, and breathtaking terrain. The former home of the Hilton Head Senior International from 1982 – 1984, Shipyard Golf Club was rated as one of the finest layouts on the Champions Tour. All holes feature Champion Bermuda Greens and the staff expertly keeps the course in great condition. Whichever 9-hole course you play—The Clipper, The Galleon or Brigantine—you can expect a challenging day to say the least. Water comes into play for twenty-five of the holes. And if that isn’t enough, how about trees, bunkers, alligators and lots of demanding tee shots? Right at the start of your Shipyard golfing experience at Brigantine, you’ll meet Hole #2, a very scenic and very trying second shot over water…a local favorite.